ENERGY VISION NX is a very powerful tool for monitoring and analysing the energy efficiency of buildings and installations. Built on CentraLine Niagara web technology, the software provides a professional tool for energy benchmarking and analysis, and for managing all energy-related data. 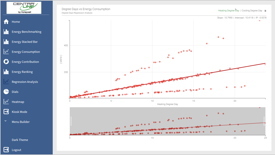 Daily Consumption: Detect inefficient energy usage by comparing multiple days across their 24-hr periods. This flexible software allows users to create browser pages with tailored content, and scaled to suit any screen solution and device. It also includes the latest cyber security standards. 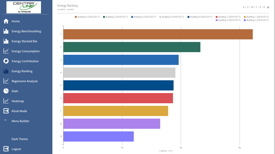 Visualise and compare the performance of your sites, buildings and plants. Start energy efficiency actions optimising your biggest consumers. Being fully web-enabled, ENERGY VISION NX allows users to monitor and analyse energy consumption locally or remotely from your platform of choice. Different access rights and viewing options allow tenants, facility managers and service partners to optimise energy consumption. 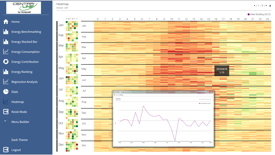 CentraLine’s ENERGY VISION NX converts technical data into easy-to-understand visual graphics. Benchmarking and ranking of energy consumption between meters, zones, systems, buildings and sites all help the user to focus on the biggest consumers and to begin energy-efficiency measures where they will yield the greatest benefit. • ‘Push reports’ including the annual EN 50001 audit documentation are automatically generated and can be stored locally or sent to you via email. Compare your consumption with the line- of-best-fit against outdoor temperature, degree days, or any other value of interest. 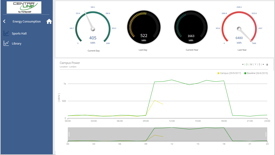 For a small standalone site such as a school or office, ENERGY VISION NX can provide an overview of the most important energy consumers by showing a rotating sequence of dashboard pages. This is ideal for use in a building foyer or reception area, where occupants can be encouraged to understand how they can improve the energy efficiency of their building. For more information about ENERGY VISION NX, go to the link below.